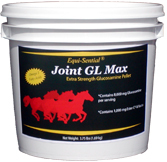 Equi-Sential® GL Max is an extra strength glucosamine pellet that provides nutritional value and joint relief. Equi-Sential® GL Max provides a potent 8,000 mg glucosamine HCl per once combined with yucca to provide maximum joint therapy. Additionally, your horse is provided with the powerful antioxidant effects of Ester C® (Vitamin C) and naturally occurring Vitamin E along with essential Omega 3 Fatty Acids.